Well, I am a 25 year old from Virginia in the United States. I am a Producer, Songwriter & now an Aspiring artist. I enjoy partying, Sports, Working out, spending time with loved ones, and of course Music. I have been a Producer since about Age 15. There is just something about music that sooth’s my soul & gives me inner peace. When there are millions of independent mixtapes on the internet, what sets you a part from others, why should music fans download your mixtape? I believe in variety. I like to stand out with not only Producing my own beats but also by Singing & rapping. I LOVE to mix up different Genre’s and ALWAYS try to create a new sound. I try to stand out by using my life as a jukebox. I use my personal experiences as songs and I put out what I feel in my heart. You are signed to Sony, presumably because of your work in production, how did that come about? There has been a BIG rumor that I am signed to Sony Record but in fact I am not. I have done work FOR Sony & RCA records but I am not in fact signed with them. I am a independent Artist still. According to your Twitter account, @BBeckMusic, bio you worked on Travis Porter’s “Aww Yeah” track. Have you worked with any other big names or been asked to? What has made you decide to turn your attention to vocals and being the artist rather than the producer? I have ALWAYS enjoyed singing and writing songs but I NEVER had the time to work on my own project. I finally had the time to do so and said to myself, why not? The process has been long and very stressful but well worth it in the long run. 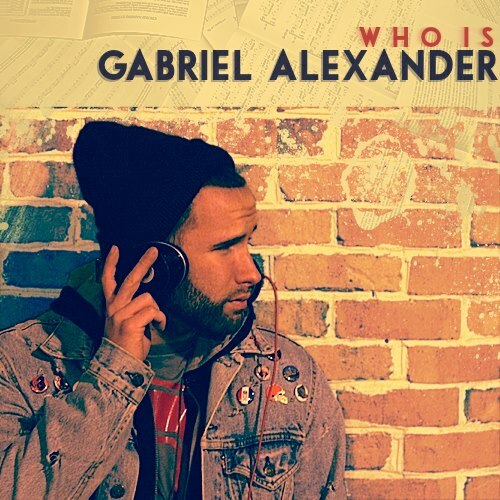 Is “Who Is Gabriel Alexander” being promoted by Sony too, or is it completely independent? This is a 100% Original project that I have started and promoted by myself. It has been very hard but also enjoyable as well. Without the help of Friends & Fans & those who have supported me, I would be nothing without them. Why have you used a new pseudonym as an artist to your producer alias BBeck? In the past I would Feature on Hooks for other Artist’s but people would not know that it would be me on the hook, all they would say is “nice beat!”. I feel that with “Gabriel Alexander”, people KNOW there is a difference. B-Beck is my producer name & Gabriel is when I sing & rap. How have you felt about the support you have been getting and hype surrounding the mixtape? HUMBLED. The support I have been getting is just amazing. Lost for words on this one. Again, without the support I would be nothing. It has been such a Emotional moment for me. To go from nothing in life to have something to live for is absolutely amazing. Have you a number of downloads you aspire to achieve? If you weren’t involved in the music industry, what would you be doing as a career? I would look into psychology. I love helping people with their problems. It really makes me happy to see me people overcome just as I have with my life. If you could collaborate with any artist in the world right now, who would it be? and why? I would LOVE to collab with Calvin Harris or the likes of Big sean and so on….I feel I could work with any Artist honestly. MTV recently announced their “Hottest MC’s In The Game” list, who do you think is the hottest artist in Hip Hop? I feel their list is 100% TERRIBLE lol I would have to say currently right now “Drake”. It can be a toss up easily with the likes of Big Sean, Kendrick & Jay-Z & Nas but some of those names just DO NOT belong up there in my honest opinion.